Okay, I don't follow golf. At all. In fact, I don't know how to play golf and don't really want to, despite how it's apparently supposed to be a good thing to know in business. If "golf" isn't preceeded by "miniature," I don't play it. But, a headline on Yahoo! 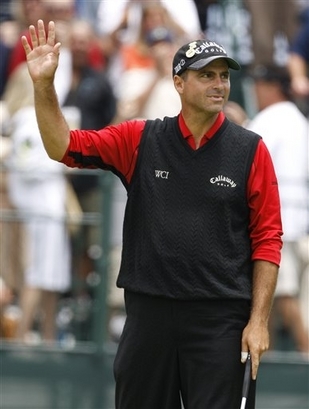 caught my eye (as it's wont to do): "Major underdog Rocco Mediate takes Tiger Woods to sudden death in the U.S. Open playoff." The name rang a bell. No, not Tiger...I mean, he sells Buicks or some other gas-guzzling American car so of course I knew him...I mean Rocco. Why? Because his dad cut my mom's hair. No joke. Anthony of Anthony's salon, the premier salon of Greensburg, PA. Rocco, his son, was narrowly defeated by The Tiger for the US Open. I'd tell you the score, but as I said, I don't understand golf. What I found most intriguing was this article by Dan Wetzel of Yahoo! Sports where he says: "What, you think some guy from an old mercantile town in western Pennsylvania is going to be depressed about not winning a bunch of majors?" Now, I've heard my town called a lot of things. "Hicksville," for one, or "not part of the Pittsburgh metro" (Census confirms it is), or most popularly "Where?" but "old mercantile town" is a new one. I'm going to use that. When someone says "Where are you from?" I'm going to say "an old mercantile town in western Pennsylvania." That sounds so much better than how the convo normally goes: "Where are you from?" "Western Pennsylvania." "Oh, where?" "Near Pittsburgh." "Oh, where?" "Greensburg." "Where's that?" "A small city about 30 miles southeast of Pittsburgh." "Oh."